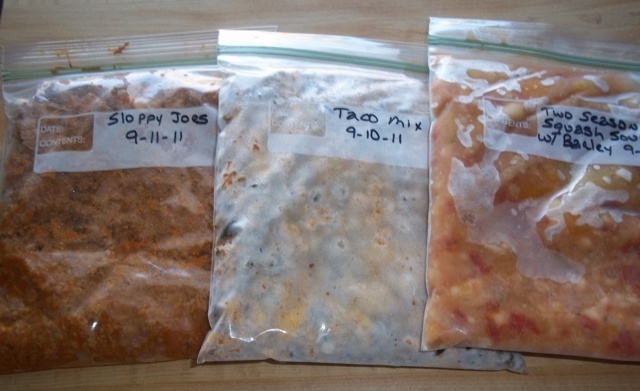 When I had little freezer cooking sessions over the last few weeks, I decided to freeze the food in family meal size portions and in smaller bags for me and the girls for lunches. This works like a charm, and I now have a nice rotation of meals for us for lunch time. It is a bit like having my own frozen meal from the store, but this one is much cheaper, healthier and tastier. Works for me! My wife freezes leftovers all the time particularly pasta sauce, chili, lasagna, and chicken dishes. They are such a time saver. Chili and pasta sauce are two of our favorites to freeze too. Good idea! It took me years after my kids left home to figure out how to cook for two and still we sometimes have leftovers to freeze. Usually though, my freezing is now on the front end. Meaning that I buy the family pack of chicken then break it up to single serving sizes right away and throw it in the freezer. I can imagine after you are used to cooking for kids, it is hard to adjust to cooking for two! Just did it this weekend. It’s impossible to make football chili for one without leftovers for weeks. ok, this is brilliant! My house is still running over with boys with hollow legs (They are always hungry) and I keep sane by filling my freezer with ready made meals. Home cooked meals in a pinch: love it! It never occurred to me to make small portions! I am going to start doing this so I can have better meals for lunch and can send prepared meals to work with my husband! I love doing this for exactly the reasons you stated.